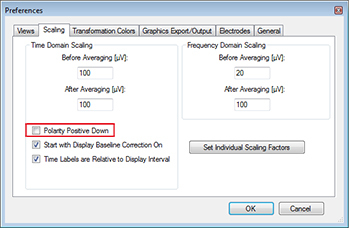 In this support tip we are presenting 10 simple, but valuable tricks and tips that will make your work with BrainVision Analyzer even easier and more efficient. Help! I have accidentally closed the primary and the secondary tabs in the History Explorer. I need to rename raw data sets. How should I start? I want to upgrade the software to the latest version, but the Update Manager does not work. Why are the waveforms depicted upside down? How can I append data sets? During the EEG recording several annotations were manually added to the file. How can I quickly find these annotations in Analyzer? Tip: Remember to purge deleted nodes! Tip: Keep yourself up to date! Tip: The option “Operation Infos” complements your lab book! Tip: Did you know that Analyzer offers additional functionality in the form of Solutions? 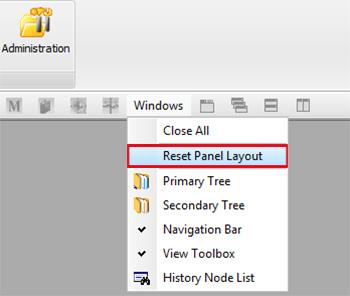 You can reset the panel layout by selecting “Windows → Reset Panel Layout” in the toolbar. When you use equipment from Brain Products, each EEG recording consists of three dedicated files: the data file (*.eeg), the header file (*.vhdr), and the marker file (*.vmrk). These files are connected by internal links which contain the original names. Therefore, it is not sufficient to rename the three files. In order to facilitate this process, Brain Products offers an additional tool that allows renaming multiple data sets in a single step. This tool can be sent to Analyzer users upon request. Please contact the Scientific Support team (support@brainproducts.com). The Update Manager is designed to allow the update of individual modules or bug fixes. 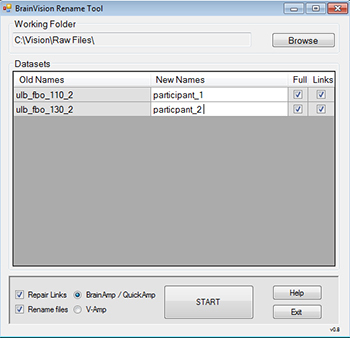 In order to upgrade to the latest version of the software, you need to start a full installation using the installation file, which is available online at www.brainproducts.com. By default, Analyzer uses the ERP convention to plot positive values down. You can easily change this setting by choosing “File → Configuration → Preferences → Scaling”. The main requisite to append data sets is that their main properties need to be identical. This step should be performed prior to applying any processing steps. 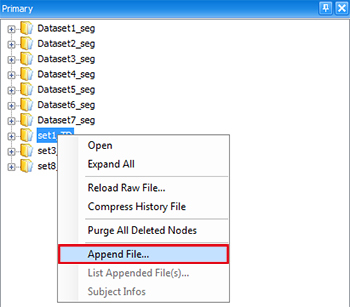 The option “Append File” is available in the context menu of the history file. During the EEG recording several annotations were manually added to the file. How can I quickly find these annotations in Analyzer? 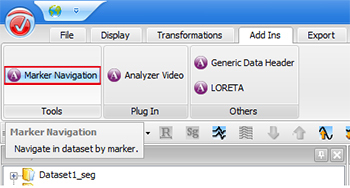 Analyzer offers a dedicated Add-In that facilitates the navigation when the aim is to find specific markers. You can search for marker type and marker description in order to navigate directly to the time interval where the marker is present in the data set. This option is available under “Add-Ins → Tools → Marker Navigation”. 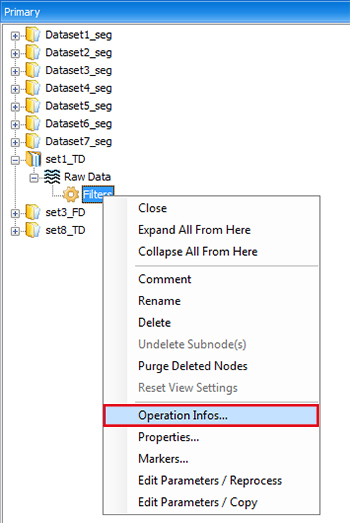 Analyzer offers the option to undelete nodes. This means that when a node is deleted from the History Tree®, it is kept in the history file so that it can be recovered any time. Consequently, this increases the size of the history files and may in extreme conditions lead to memory and/or performance issues. 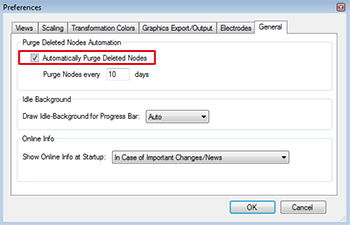 We recommend purging all unnecessary deleted nodes. This option is available by right-clicking the respective node. 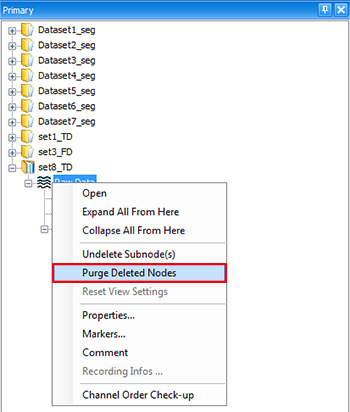 Purging all deleted nodes in a history file can be achieved by right-clicking at the topmost level of the History Tree®, e.g. on the history file name next to the book icon. At this level we recommend to also apply “compress history file” in order for it to actually take an effect on the file size. Another possibility is to change the preferences such that purging takes place automatically within a certain time interval. You can define the preferences under “File → Configuration → Preferences → General”. However, this will not compress the history files on disk. Analyzer has a dedicated online information page that can be shown at startup. This page contains the latest news about the release of updates as well as information about dates of workshops or other relevant news. We recommend adjusting the preferences in order to be informed in case of important changes and announcements. You can define the preferences under “File → Configuration → Preferences → General”. 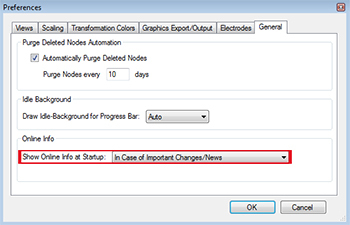 The settings used for each processing step in the History Tree® are stored in the “Operation Infos”. This is a useful way to help you keep track of your analysis. The “Operation Infos” are available in the context menu of the node. The Solutions are a collection of plugin functions that complement the functionality covered by the Transformations and the Export functions. The Solutions package needs to be installed separately and is available in the download area at www.brainproducts.com.